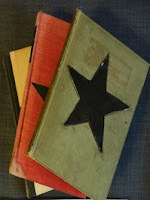 This auction is for a set of three books created as props for UNBOUND provided by the producers and writer of the series. These props are handmade and one-of-a-kind. One of the books for auction here was used on-screen in several of the episodes of UNBOUND as demonstrated in the photo included with this listing. The other two books are unused mock-ups and prototypes. This auction is for all three books and will be shipped with the photo shown, which is of a scene from UNBOUND showing the book on-screen. In addition, a signed letter from series producer Lawrence Peryer will be included, describing the date and context for the prop in an effort to provide documentation of authenticity. For the first auction, the producers have chosen to benefit Memorial Sloan-Kettering Cancer Center in New York City. Bid now on eBay.